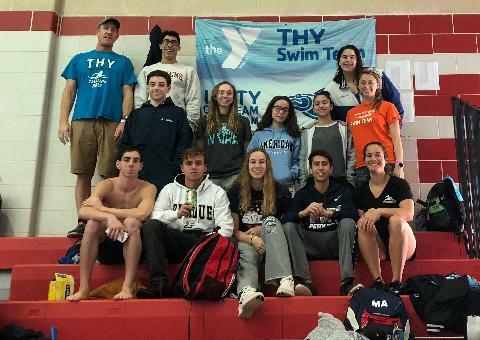 Founded in 2002, the THY Swim Team has risen rapidly to national prominence, currently ranking in the top 11% of national USA Swimming programs and in the top 9% of national YMCA swimming programs. THY athletes not only improve athletically (whether it's obtaining a first PA district time or a USA Swimming Senior National cut), but they also grow to deliver YMCA's mission for youth development, for healthy living and for social responsibility by embracing the core values of caring, honesty, respect and responsibility. THY Swimming is an Age Group and Senior Level YMCA/USA Competitive Swim Program. Thus, THY offers the benefits of BOTH YMCA National Swimming and USA Swimming. THY is looking for swimmers with a high level of commitment to the sport who are interested in participating in year-round swimming. We are a non-profit club. The team is run by a village of volunteers working tirelessly to ensure the success of our members. Our Board of Directors meets monthly (and more in-season). All members are welcome at each meeting and encouraged to be involved in meets, team activities and fundraisers.